Make no mistake about it, Larry Eustachy can coach basketball. Witness his 13 year NCAA Division I coaching record of 260-145 (.642) winning percentage through the 2002-03' season. He sat out the 2003-04' season having resigned from Iowa State in May of 2003. 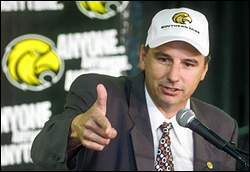 It was announced in late March of 2004 by Southern Mississippi Director of Athletics Richard Giannini the school had hired Larry Eustachy to become the head coach of men's basketball. championships. He's well respected around the country and among his peers. He will be a great asset in moving our basketball program forward to the top of Conference USA." Dr. Shelby Thames and Director of Athletics Richard Giannini and everyone else for believing in me. I'm looking forward to taking Southern Miss basketball to a national level." team in only five years," said Chuck Bell, Director of Athletics at San Jose State University. "He did so with the greatest of integrity and in a very tough conference which at the time included UNLV and New Mexico State when both teams were going annually to the NCAA Tournament. Larry Eustachy, his wife Stacy (a graduate of Mississippi State) and their two sons (Hayden & Evan) became immensely popular in the community and in the state of Utah. I think this is a win-win for the Eustachys and Southern Miss. I don't think there is a better coach or a better family in the country." Eustachy's five year career at Iowa State saw him coach the Cyclones to a 101-59 (.631) winning percentage, back to back Big 12 Conference Championships and two Associated Press Top 10 national rankings. The Cyclones went to the postseason NCAA tournament consecutive years and advanced to the "Elite Eight" following the 1999-2000 season. Iowa State went to the NIT following the 2002-03' season. Eustachy was named Big Twelve coach of the year twice during his tenure at Iowa. He was named AP National Coach of the Year and the United States Basketball Writers Association Coach of the Year following the 1999-2000 season. He was runnerup in the AP balloting following the 2000-01' season. In Eustachy's 13 seasons as a head coach he has had only one losing season. His teams have been to the NCAA postseason tournament three times, including the "Elite Eight" and the NIT twice. He has proven time and again he knows how to win regular season conferenct titles. In six of his 13 seasons Eustachy has coached a team to a conference crown. He is one of only eight coaches in NCAA Division I history who has won a regular season conference title at three different school. Eustachy also has won four conference coach of the year awards, two while coaching Utah State and two while coaching Iowa State. 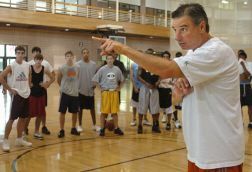 Larry Eustachy is a tough, demanding coach who knows how to get the best out of his players, as Eustachy has said; to have a successful basketball program you need to, "Hold the players accountable for their actions. I don't want to take the fun out of the experience, but losing is no fun." He also has served as an assistant coach at Ball State, Utah, Idaho, Mississippi State and Citrus (California) Junior College. Advanced to the "Elite Eight"